Dental implants and dental bridges are both dental restoration options that fill the space left by missing teeth. It's important to replace missing teeth as soon as possible, because leaving gaps in the teeth could result in serious dental problems. The surrounding teeth could shift out of position, causing discomfort, TMJ symptoms, difficulty chewing or speaking, and possible tooth decay or gum disease. Missing teeth could also cause supporting bone to deteriorate over time, which results in changes in the appearance of your whole face. Should I choose a dental bridge or an implant? Dental bridges, quite literally, "bridge" the gaps left by missing teeth. They are attached to the adjacent teeth of the missing tooth. Dental implants are tooth root replacements made out of titanium and capped with a dental crown to permanently replace a tooth. 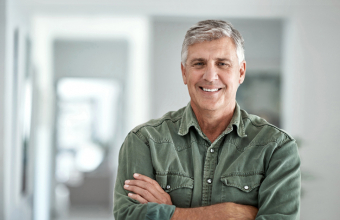 The benefit of dental implants is that they look, act, and feel like natural teeth. They are also more secure and permanent. Nonetheless, a dental bridge may be a better tooth replacement for you if the neighboring teeth have large fillings, and may need crowns or caps down the road. In addition, if the tooth or teeth have been missing for a long time, the gum and bone will have receded to some extent. This will mean that additional, more invasive procedures may be required in preparation for the implant, such as bone and gum grafts. For some people, getting an implant (as opposed to a bridge) is not worth the extra time, discomfort and expense. Ultimately, only your dentist can tell you if a dental bridge or a dental implant would best address your tooth replacement needs. 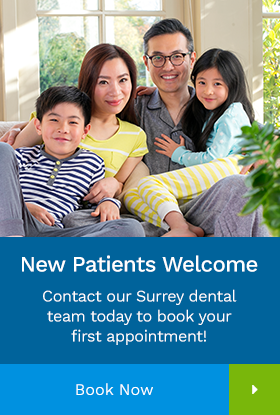 Contact our Surrey dentists today for a consultation.